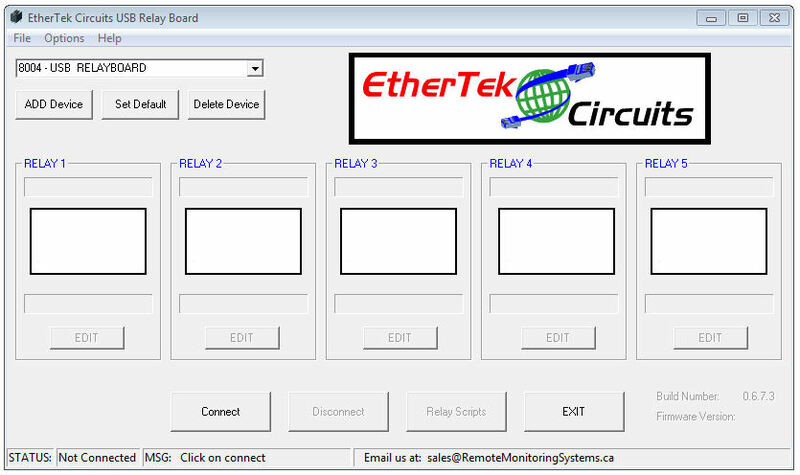 The Windows Client program is used to control the relays on the USB Relay board. The client program stores all of the default variables and board settings in a database "USBrelay.MDB". The database is located in the installation folder. An installer is provided. Follow the examples below to have the executable, dll, and database installed on your computer. When starting the client program for the first time, it looks to see if a board has previously been connected. If not, the add device dialog box pops up. This list is automatically populated with however many USB Relay boards that are found to be connected to the host. Each USB Relay board is programmed with a unique identifier. The "Refresh" button will re-poll the USB port and find any units plugged in. NOTE: Windows Vista and Windows 7 users may have to run the client program as Administrator. Select the desired unit and hit the "ADD" button. The selected device has now been added to the database. The main program will now appear. If the "Add Device" dialog box is closed without selecting a device, the main program will still open, however, a device will still need to be added in order to poll information. To add another device, click the "ADD Device" button. If there are multiple USB Relay boards in the list, you may make one default (shows up in the list box first) by selecting the "Set Default" button. If at any time you wish to remove a device, have the desired device selected in the drop-down menu and click the "Delete Device" button. Name - Displays a name given to the relay. 25 Characters MAX. 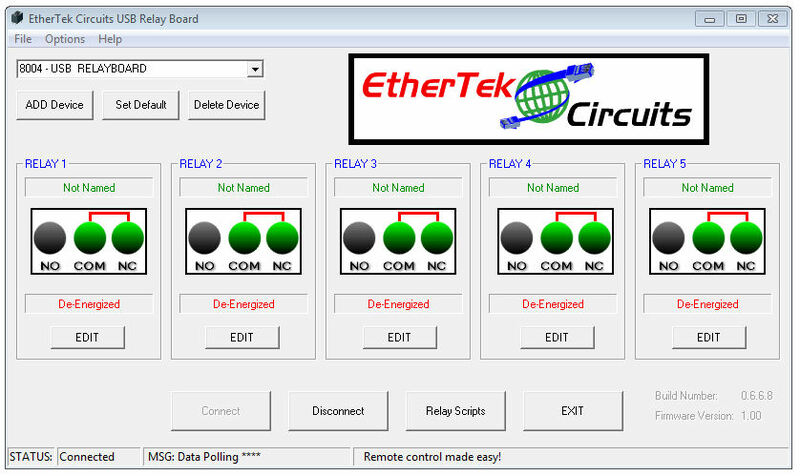 Relay - Displays a graphical representation of the current relay state (NO or NC). State - Displays a name given to the relay when it is energized or de-energized. Relay Scripts - Allows complex relay actions with simple commands. Holding the mouse pointer over the relay icon will bring up a tool tip which contains notes about how the relay is hooked up. If any of these settings needs to be changed, or if more advanced features are needed, click on the "Edit" button. Each edit button is only applicable for the relay of whichever group it is in. In the example below, the "Edit" button for relay 1 is clicked. Relay Action Confirmation - When this is selected, confirmation will be needed on each relay action. If Relay Action Confirmation is not selected, then relay actions are immediate. Relay Name - Enter a descriptive name for this relay. Relay Notes - Enter some notes that describe the function of this relay. Normally Closed State - Enter text that represents the Normally Closed state of the relay. Normally Open State - Enter text that represents the Normally Open state of the relay. Relay scripts are made up of simple commands that control the relays. Complex relay actions can be performed to control your equipment. 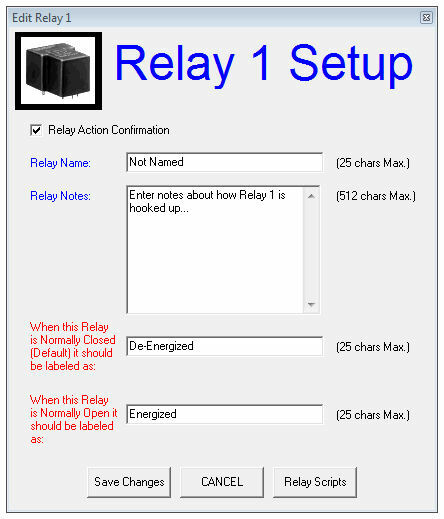 The screen shot below shows the Relay Scripts dialog box. This dialog box shows the list of current relay scripts stored in the database and provides a way to execute, edit, and delete them. 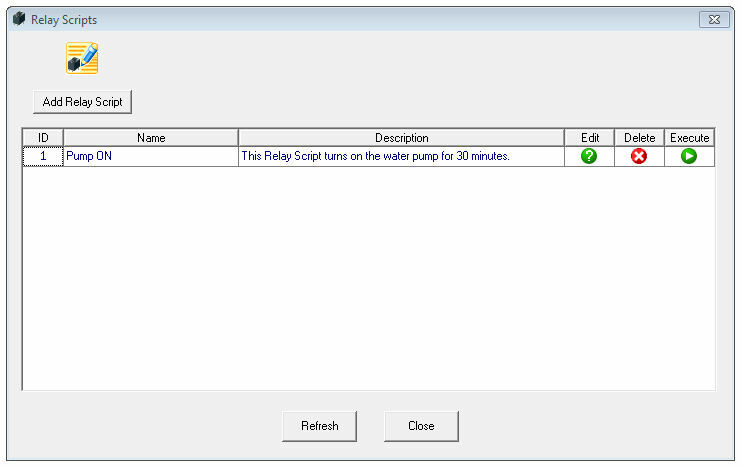 To edit a relay script, double click on the green edit button to be taken to the dialog box below. Relay scripts are built using available comands from the left box and adding them to the selected commands on the right. 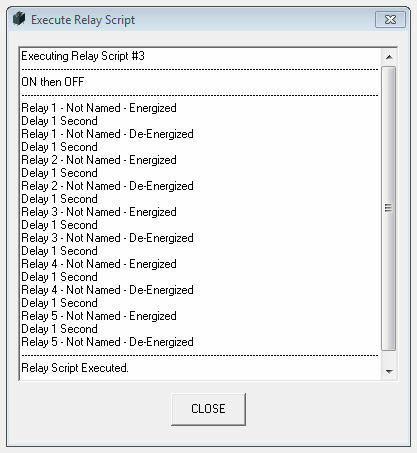 To execute a relay script, double click on the green execute button on the Relay Scripts dialog box. The screen shot below shows a relay script executing commands. If power draw on the USB port is a concern due to many devices plugged in, JP1 (LED ENABLE) may be removed from the USB Relay circuit board. Removing JP1 will disable the power indicator LED. 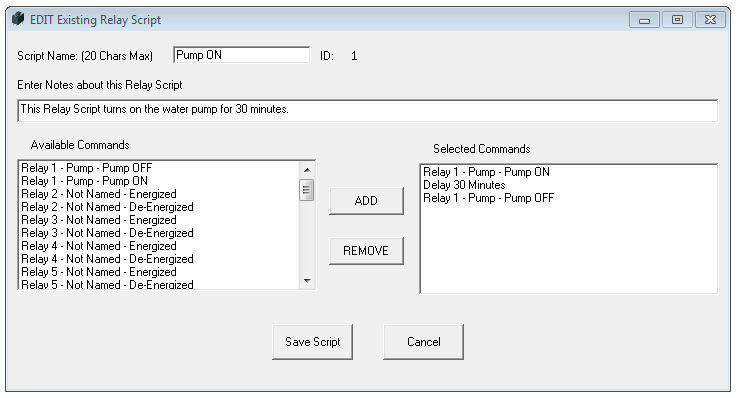 If more power saving is desired, selecting the "Options" pull down menu from the main screen and then clicking on "Relay Options" will bring up the dialog box shown below. 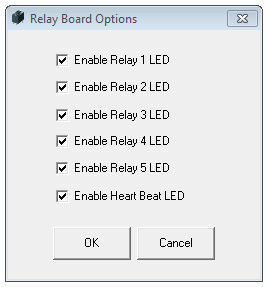 To disable LEDS for each realy and the "Heartbeat" LED, simply uncheck the corresponding check box and then click the OK button. The LED options are preserved even when the USB Relay board has been power cycled.